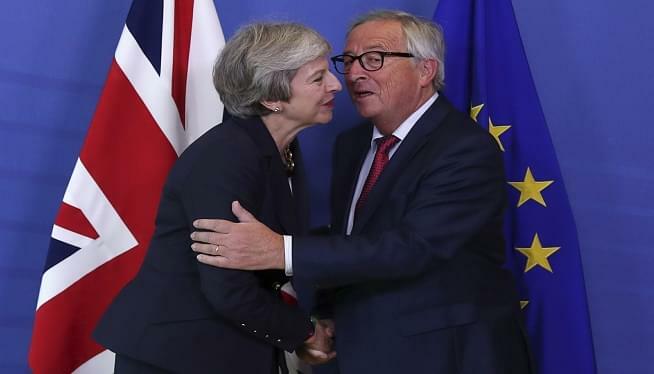 BRUSSELS (AP) — European Union leaders gave themselves several more weeks — perhaps until the end of the year — to clinch a friendly divorce with Britain before their separation, after a Brexit summit Wednesday avoided any friction but also produced no tangible results. British Prime Minister Theresa May provided none of the substantial new proposals that EU Council chief Donald Tusk had urged her to bring to the table, giving the 27 other leaders little more than a plea for goodwill. “The last stage will need courage, trust and leadership on both sides,” May told her EU counterparts. Officials said there were hints that Britain might consider extending a post-Brexit transition period beyond the proposed 21 months to make talks on a future trade relationship easier. But the meeting that had been painted as a make-or-break moment for a Brexit deal ended with a whimper. “Nothing new tonight,” Dutch Prime Minister Mark Rutte said after an evening when not exacerbating divisions with Britain was seen as a victory in itself. Chief EU negotiator Michel Barnier said that “we need much time, much more time, and we continue to work in the next weeks” with his British counterpart. So uncertain was that prospect that a special EU summit on Brexit that had been penciled in for next month to finalize a deal was taken off the table. Rutte said EU leaders would assess the situation in the coming weeks and “stand ready to meet if necessary.” The next official EU summit is scheduled for December. Despite the lack of progress, the mood music at the summit was positive. May spoke of “working intensively over the next days and weeks” to achieve agreement that avoids a no-deal departure from the bloc for Britain on March 29 that could create chaos at the borders and in the economy. A deal must be sealed soon so parliaments have time to give their verdict on it. Underscoring the newfound sense of non-urgency, Prime Minister Sebastian Kurz of Austria, which holds the rotating EU presidency, even spoke of the “coming weeks and months” to get a deal and sought to impose a soothing calm. “There’s no need to dramatize matters. It’s always the case with negotiations, that in the end there are challenges,” Kurz said. May addressed other EU leaders before they gathered for a dinner of pan-fried mushrooms and turbot in wheat beer — without her — to assess the state of Brexit talks. The British leader urged her counterparts to redouble efforts to find the way to a deal, but European Parliament President Antonio Tajani said she did offer them concrete new proposals. “Politically speaking, a will was expressed to move forward and reach agreement but there was nothing substantively new in terms of content,” Tajani told reporters. May spoke a day after Tusk implored her to present new ideas for resolving the tricky problem of how to keep the land border between the Republic of Ireland and the U.K.’s Northern Ireland friction-free once Britain no longer is an EU member. Tusk advised May that “creative” thinking from Britain was required to avoid a hard border on the island of Ireland, the issue that has brought Brexit negotiations to a standstill. Both sides agree there must be no hard border, but each has rejected the other side’s solution. At present the two sides are proposing that Britain remains inside the EU single market and is still bound by its rules from the time it leaves the bloc in March until December 2020, to give time for new trade relations to be set up. Many suspect that will not be enough time, which has led the EU to demand a “backstop” to ensure there are no customs posts or other controls along the currently invisible border between Northern Ireland and Ireland. EU leaders have recently suggested that the transition period, currently due to end in December 2020, could be extended by a year to provide more time for a trade deal to be forged that would make the backstop unnecessary. Britain says it has not asked for an extension — but didn’t rule it out Wednesday. The summit continues Thursday with an agenda limited to some issues both sides firmly agree on, including fighting cybercrime and dealing with an assertive Russia. Reaching agreement with the bloc is only part of the British leader’s problem. She will have to get any deal past her Conservative Party — split between “hard” and “soft” Brexit factions — and past her parliamentary allies in Northern Ireland’s Democratic Unionist Party, who insist a solution can’t include customs checks between Northern Ireland and the rest of the U.K. It must also be approved by Britain’s Parliament, where May lacks an overall majority. Lithuanian President Dalia Grybauskaite said that 2 ½ years after Britain’s Brexit referendum, the country had still not explained clearly how it wants to leave the EU.